Home Mutual Fund How Systematic withdrawal plan in mutual funds works? How Systematic withdrawal plan in mutual funds works? Sometime back I wrote one article on Systematic withdrawal plan which shows how SWP works best with monthly income plans (MIPs) as compared to the dividend payout option, which resulted in favor of Systematic withdrawal. 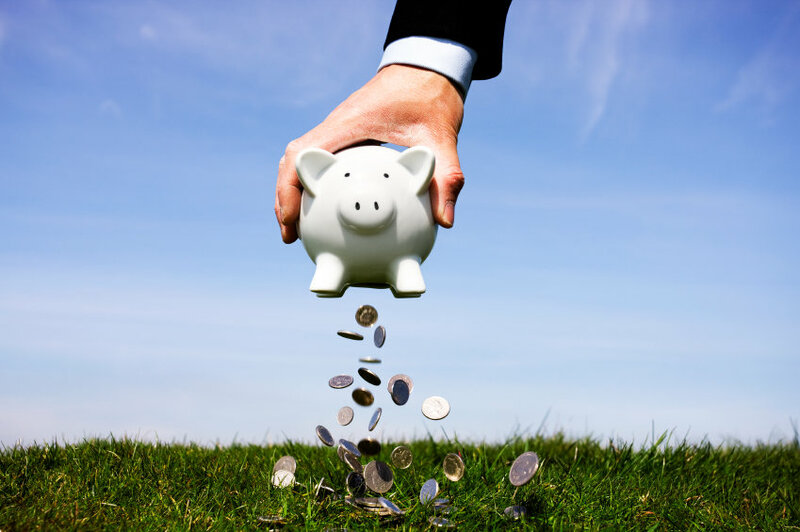 This article is about how systematic withdrawal plan works with other mutual funds. Does it make sense to go with SWP in case of equity mutual funds, how the transactions have worked out in the past and when one should give this a try, if at all. This post is the result of long discussion with my friends and fellow financial planners on my bucketing retirement strategy article written for business standard. In that strategy I explained how post retirement income needs to be generated by creating different buckets for different years and thus how one should invest in different asset classes to manage the inflation and growth. Though I still stick with my strategy of keeping debt and safe investment in first bucket and increase the exposure to equity in other 2 buckets, but still I did some back testing to check , how keeping money in only equity or equity oriented hybrid would have resulted. What is Systematic withdrawal plan in mutual funds? But as I said that it is exactly opposite to SIP which means that in SIP if Market/NAV is down you get more units, but in SWP when Market/NAV is down you withdraw more units. Why and when one should use Systematic withdrawal plan facility? The simple answer to this is that SWP should be used to supplement your regular income. Regular income may be coming in the form of Salary, Pension, fixed interest etc. In case of Retirement buckets articles, I have clearly mentioned that the first bucket should comprised of very safe and regular income generating assets which includes bank Fds, Post office schemes, annuities etc. , in second bucket you should take some equity exposure through hybrid funds and should be used to supplement the regular income that is being generated in the first bucket, and this may be done through SWP as this is more tax efficient mechanism, the third and last bucket should be filled with pure equity or equity oriented hybrid funds which should be used to fill up the second bucket or even first bucket through profit booking or dividends earned, as both will generate tax free returns. Besides retirement income planning, you can also use SWP when you want to create discipline of withdrawals from savings. Say for e.g. you have saved Rs 10 lakh for family expenses of 2 years, when you plan to take sabbatical from job. Now rather than handing over the complete money to family members or keeping this in saving bank account and leaving the withdrawal option to as and when, it is better to decide onto a fixed amount which may be equivalent to your salary and register that amount as SWP by parking the total money in Liquid Mutual funds. The structure will automatically transfer a fixed amount to bank account by redeeming the required units. This on one side have not left the money idle, neither left a scope of getting the money misused and on the other side made arrangement of regular inflow for the family members. How systematic withdrawal plans in mutual funds work? You first need to select the fund, then decide the rate at which you want to withdraw the amount, you may also decide a fixed amount or can also ask for appreciation amount only. As mutual funds are not a fixed return instrument and also the withdrawal rate is as per your choice, so the total return from the structure depends on product/Mutual fund return and your withdrawal per month. In my post on SWP in MIPs, I had assumed the rate of withdrawal as 8%, withdrawn monthly just to keep the comparison open with POMIS too. That calculation has shown that rather than taking dividend payout, if investor goes with Systematic withdrawal then the net returns would be much better. The XIRR calculated proves that correct and also was better if compared to POMIS. Whenever you select a particular fund that should always first fit into your requirement and then should suit your risk tolerance as to how much volatility you would be able to absord. As I wrote above in this post that in SWP you withdraw more when NAV is down, thus it is always better to make the SWP arrangement with less volatile funds which may be debt funds or debt oriented conservative funds. But keep in mind that your rate of withdrawal should always be less than the rate of return expected from that fund. Withdrawal rate – 8.5% per annum and withdrawal frequency is monthly. 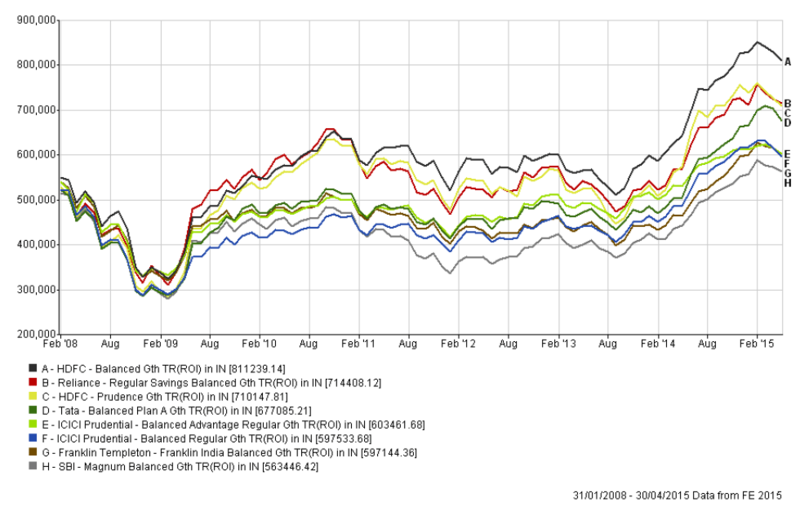 Last 3 years performance of SWP in all categories above, has went very well. I found the Hybrid category’s performance better than other 2. Less volatile than equity but much better than debt. 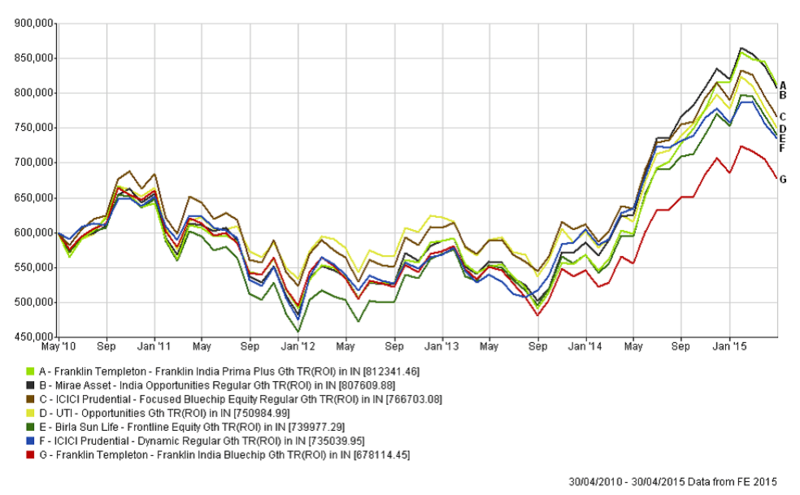 Debt funds has generated returns better than Post office MIPs. Even in last 5 years time frame, Hybrid Equity Mutual funds have performed much better than debt funds and even then equity funds. The reason for taking this period is to check the returns in SWP structure when luck was not in your favor and and you happen to enter the market just before a fall – Real fall, as happened in 2008 due to Subprime Fiasco. Don’t get impressed by Mirae and ICICI focused as they were launched in April’08 and May’08 respectively, thus they were not participating when the fall happened. In fact they took the advantage of entering and buying stocks after the fall. You should understand that this is extreme situation, but we cannot say that this situation will not get repeated. when and why no one can say. The above charts shows a mixed picture . Some funds have performed too well and some are yet struggling. 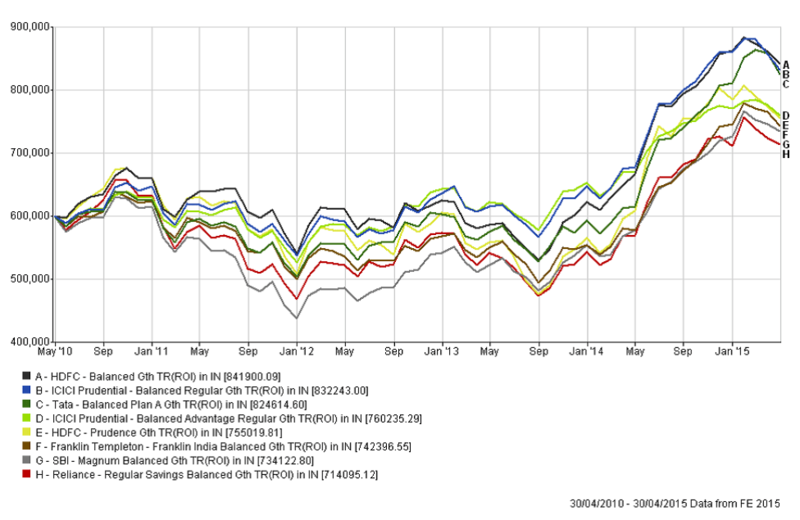 ’09 to ’14 was a period of lull…so barring few almost all funds had underperformed and it is only after Aug’14 or Feb’14 we could see some upside movements. 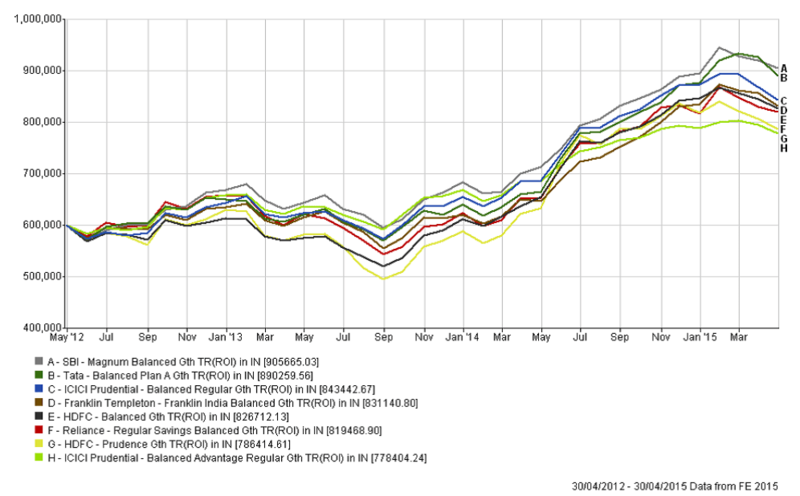 Before concluding, the article let me show you some charts for the last 10 years with same details as shown above. As the last 3 graphs , of last 10 years tells that though equity mutual funds are volatile and may not be used for systematic withdrawal plan, but the longer you stay, things get balanced out and you get good returns. Long term funda gets applied here too. 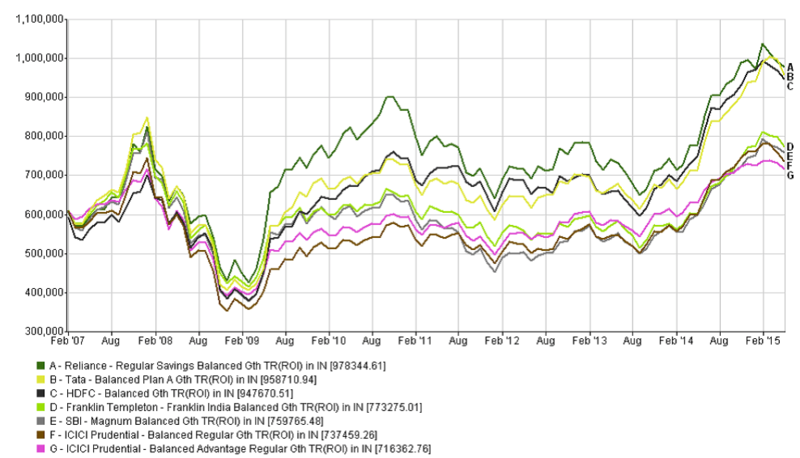 I found equity oriented balanced funds a better choice than equity or debt oriented hybrid funds. Since volatility would be a part of this structure which may or may not be acceptable to many, and more over when you are at a stage when generating income from your savings is your dire necessity as in case of retirement, you should not take chances. First look out for a safe and secure income model by using fixed return instruments and then for the balance amount you may try with SWP and that too for long term. Don’t get panicky with market movements. If for short term you want to make regular income arrangement from savings, then do Systematic withdrawal through Liquid Mutual funds. If you have any query on Systematic withdrawal plan in mutual funds, do ask in comments section below. FREE E-book- "Be good with Money"
Mutual fund SIP with Insurance – Is this the Right Choice? Portfolio Turnover ratio in Mutual funds – How Important is it? 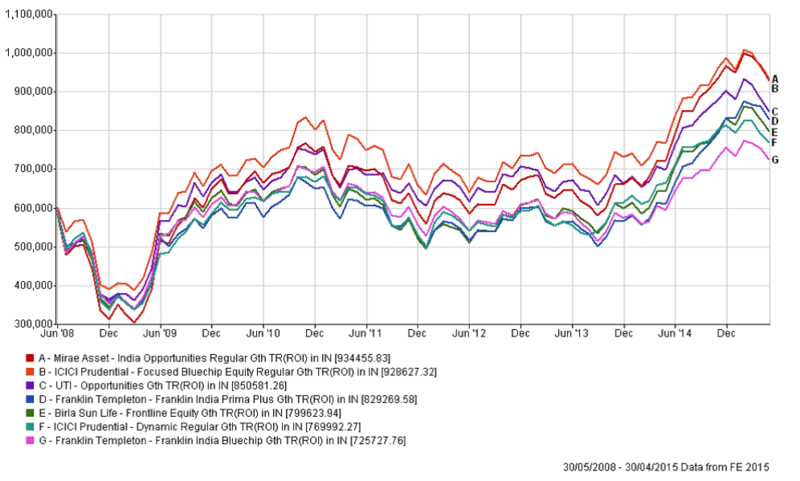 Index funds in India – How attractive is Passive Investing? 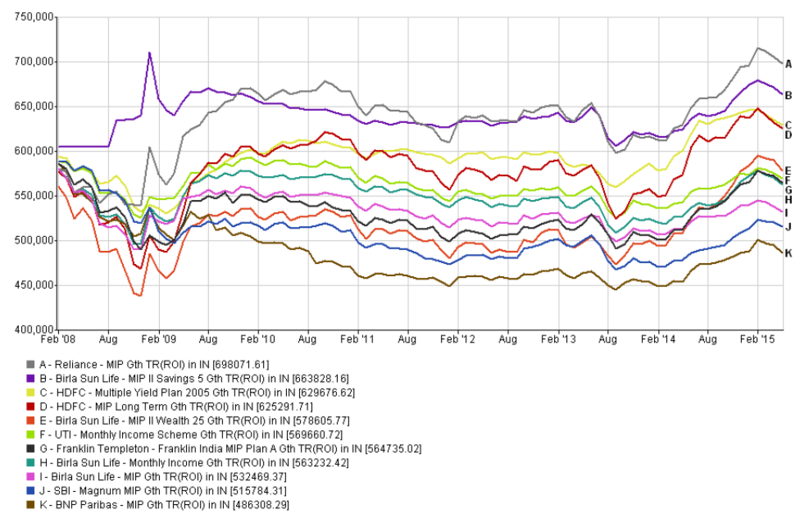 Really nice article with data for 3, 5 and 10 years showing comparative year-wise performance of top performing mutual funds in different categories. Can we have supporting excel sheets also since many of the graph lines are merging with other lines and hence year-wise movement and comparison is not possible here. Thanks for liking the article Kamal. Actually these graphs came out of software and i have not done anything manual, so i don’t have any excel sheet available with me. Moreover i believe that one has to understand the gist behind it and act accordingly. Numbers create confusion, which delays the decision making. More you analyse, less you enjoy. 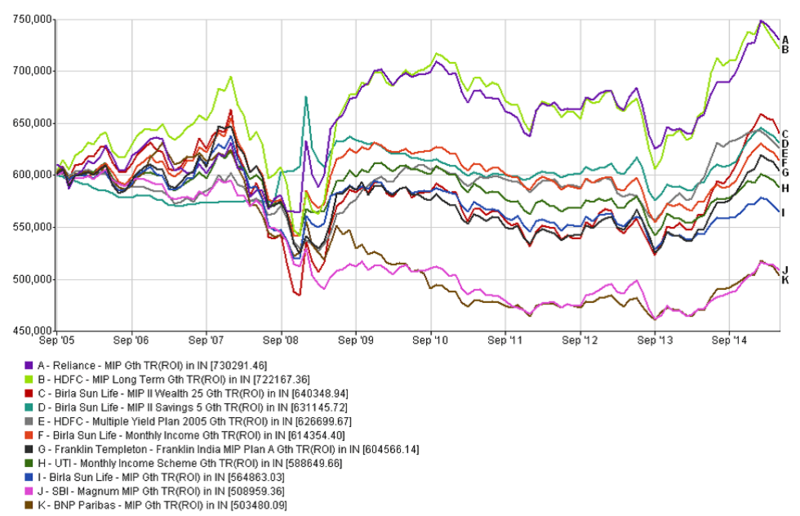 Informative article on SWP, but my analysis shows if we do SWP with multiple schemes one Equity oriented Balanced fund and second liquid fund and then do SWP mainly through balanced fund and during bad market period from Liquid fund. 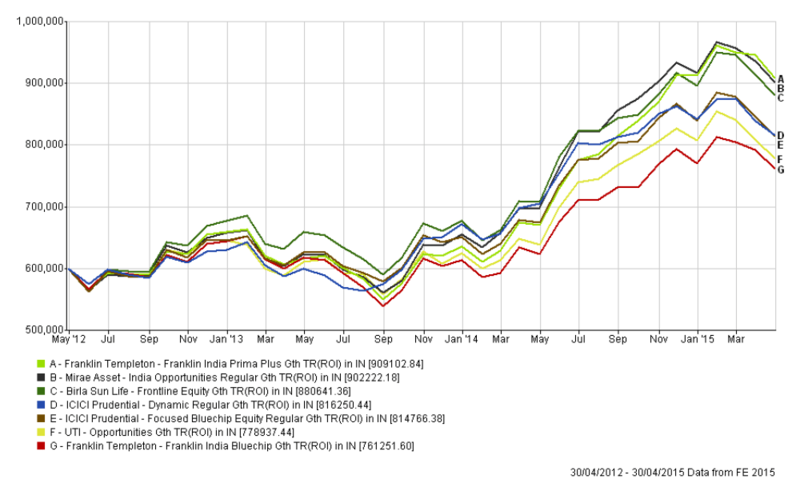 then total returns are higher. Is this correct. If YES then is there any way to instruct AMC for such SWP. say I invest Rs 3lakhs in TATA balanced fund and Rs2.00 lakhs in liquid fund on 2Nov2007 and start Total SWP of Rs 5,000 monthly from Nov’08 to Nov’16 I am left with approx. Rs3.3 lakhs in balance and Rs 0.80 lakhs in liquid fund if I take swp from balanced fund except Nov’08 to Nov’09 and Feb’11 to July’12 and March’13 to Oct’13. If total 5 lakhs in balanced I am left with Rs 3.0 lakhs. am I correct if yes how to do this in coming time say 2017 to 2027. Mukesh, in my article i have just tried to explain that how SWPs worked in the different type of funds. It is true that when you do SWP in equity funds, you tend to face more volatility, but as per past experience even then over a long period of time you have remained a gainer only. Balanced funds as you have pointed out can be a better choice, with less volatility. Timing the SWP may look feasible in Hindsight, but this is just like investing as no one can predict which side market will move and when in future. and NO AMC offers such service. As then the word Systematically would lose its meaning. This is something which an investor needs to decide and keep on stopping and restarting the SWPs as per his understanding and expectation of the market. Thanks for your detailed reply.I agree with you that to time SWP is difficult though it seems simple in hindsight. Could you throw some light how to predict downslide in very near future seeing trend for short time say 3 or 4 weeks so that SWP can be stooped and restarted. No, If i have to suggest SWP then that would only be from a balanced fund. You need to have a fund which expectedly generates more than SWP rates (6%-8%), then only over a period of time you can see growth in corpus too even after regular withdrawal. Theoretically it looks possible because while balanced fund will perform as per market swing/underlying stocks’ performance. If you are having liquid fund investment, it will keep on giving you steady return of around 8 to 9% pet year thereby insulating swings and fall in equity linked balanced fund. It actually is a good idea to have a combination of equity/equity oriented fund along with a liquid fund which will give overall a better return. Looks right with a combination of balanced fund and a liquid fund. Simply because in a balanced fund/equity oriented liquid fund, there are swings and ups and downs and therefore overall return can vary and volatile also. Whereas returns from a liquid fund would keep on growing @ 8 to 9% per year. This liquid fund return will insulate swings of an equity/equity oriented fund to a good extent. In fact, this is always a good idea to have an equity/equity oriented fund along with a liquid fund to get overall better return from your investment. 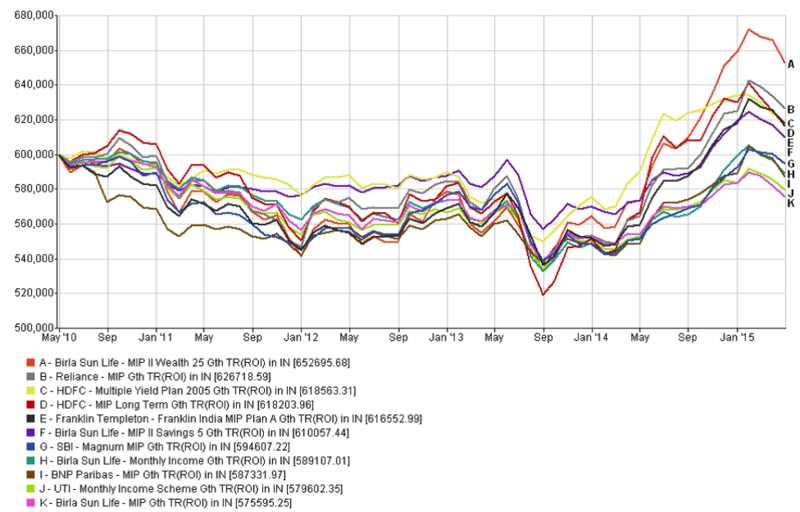 Thanks for sharing handsome charts on SWP for various schemes. I am aggressive investor in equity oriented MF schemes since 10 years and will continue for 2 more years. What would be the strategy while withdrawing money from all those invested amount. Normally 4% withdrawal rate, but I am looking for that 4% withdrawal should be distributed amount all the equity MF schemes or only one schemes? How to go ahead about this. Please share withdrawal strategy article considering the various factors like age, current investment, future goals, risk appetite etc. If it a well constructed portfolio, then, withdrawal should be roughly uniform across all the MF schemes. Otherwise one can redeem less performing funds first or early and keep good performing for later withdrawal (so that the good performing MFs can keep on accumulating more earnings during the period). Hoping that there is uniform or equal tax implications on the withdrawal. Risk appetite is an individual matter and cannot have one yardstick of measurement. I am giving my own example. I am 60 years of age. 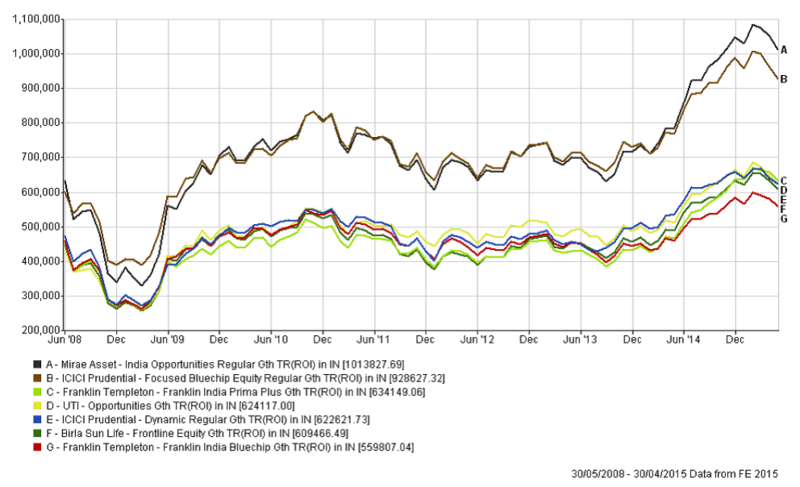 All my money invested is in diversified equity mutual fund. Not even balanced funds. Because over a longer time frame of say, 10 years or so, diversified equity mutual funds are going to perform better than balanced funds, so, why should I park my money in balanced funds. 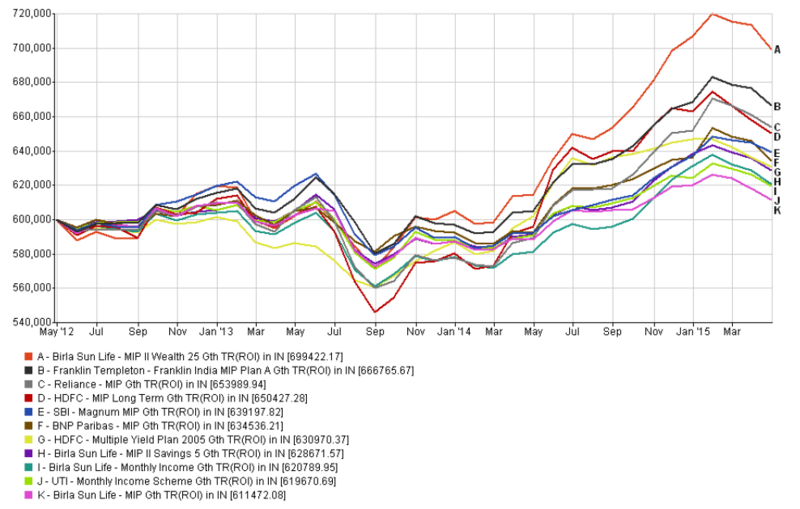 Only because at my ‘age’, my supposed risk appetite is questionable. I do not agree with all these philosophies. These are generalized theories. What will happen if I overlive normal life. Return from a balanced fund would not be sufficient for my lifestyle expenses whereas diversified equity funds would give me a good return over a very long period. These are my views about myself. One may have different views about himself or about the world. Your approach seems to be appropriate, as over a period of time the better return would be come out from long term equity beyond 10-15 years and there would be least impact of the withdrawal on overall return. Also, as you said that equal withdrawal from all equity is better. Yet I would like to hear from someone who is expert in finance like CPFians on withdrawal strategy.